These musicians and many more raise money for locals affected by the Gulf's gigantic oil spill. On Sunday, the day BP inserted a catheter-like pipe inside the oil leak in the Gulf of Mexico to help stem the spill, skepticism was in the air at Gulf Aid. “We need regulators who regulate,” said John Legend during a press conference after his set at the New Orleans benefit for those adversely affected by the oil pumping into Gulf waters since the Deepwater Horizon offshore oil well exploded April 20. 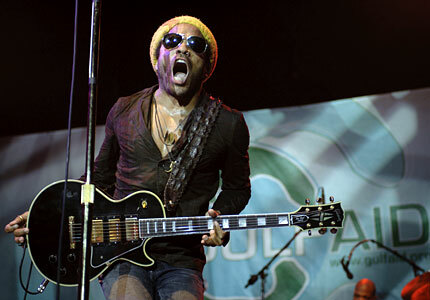 Legend, Lenny Kravitz, Mos Def, and Ani DiFranco headlined the show at Mardi Gras World that also included many of New Orleans’ finest musicians. Heavy morning rains caused casual street flooding and forced the stage to be moved indoors. Grammy-winning Cajun band BeauSoleil played on a stage erected in a warehouse surrounded by Mardi Gres floats. Rapper Mos Def recently moved to New Orleans, and he performed with the Preservation Hall Jazz Band. They debuted a new track that he recorded with Kravitz and New Orleans’ Trombone Shorty, a remake of the New Orleans classic “It Ain’t My Fault,” inspired by BP, Halliburton, and Transocean’s denials of responsibility during hearings last week. The benefit track will be available for download from iTunes today. The outrage was matched by concern about the impact of the spill. Experts cite the environmental damage done by the Exxon Valdez spill in Alaska in 1989 and the degree to which it has killed fishing in the waters off of Prince William Sound. In a region culinarily defined by seafood, the possible effects are frightening. On the human level, many commercial fishermen are out of work as parts of the Louisiana coastal waters are closed during the clean-up effort. Kravitz maintains a home in New Orleans, and he closed the night with a hard, tight show, skipping the jams that had been a major part of his recent New Orleans appearances. He only stretched out for “Let Love Rule,” calling out, “I need some New Orleans brass,” then turning over some solo time to trumpeter Shamarr Allen, trombonist Corey Henry, and Grammy-winning trumpeter Terence Blanchard.